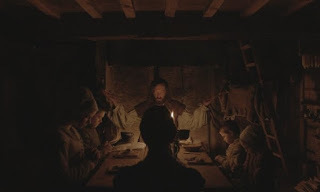 At once both inscrutable and predictable, The Witch is a New England folk tale awash in atmospherics but low on any meaningful commentary on the tropes it solemnly trods. Although written and directed first-timer Robert Eggers, the film is akin to M. Night Shyamalan’s interpretation of Nathaniel Hawthorne. After being banished from their 17th century New England village for religious zealotry, a God-fearing Puritan family settles in the dark woods. Father William (Ralph Ineson) earnestly prays for eternal life and eternal peace. But his family finds neither, as their crops fail, their livestock withers and both sons eventually vanish into the forest. The early sight of a Satanic handmaiden bathed in the blood of a newborn forecasts where this film is heading, together with some conspicuous exposition from Thomasin (a captivating Anya Taylor-Joy), the eldest pubescent daughter of William and wife Katherine (Kate Dickie). The gradually tightening tension is the product of Eggers’ acute sense of time and place, along with composer Mark Korven’s discordant score—the dissonance that greets every netherworldly apparition sounds like the monolith music in 2001: A Space Odyssey. The vernacular, costumes and set design are exquisite and immersive, fashioning a grimy, unnerving milieu. A postscript claims The Witch is a melange of actual written accounts from the era. The film teeters on being an intriguing portrait of emotional and sexual suppression spawned by a religiously oppressive culture and menstrual angst. But the film cops out by literalizing the dread, thus eroding the allegory and lending credence to the demonic hysteria. The result is just another scary movie, albeit a bewitching one.